Now that the yurt is mostly completed, we can focus on why we’re really here: to farm! We have been doing a lot of planning over the last few weeks for farm projects we’ll complete this year, and considering future projects that these plans will impact. Our first project is to build a deer fence around the garden. We had a lot of deer damage, and some raccoon and rabbit activity, in the garden this past year, and we need to protect the area before we have anything salable. We have a contractor who will set the 14′ posts several feet into the ground, and either the contractor or Gavin will put up the 8′ woven wire. Then we will have to either build or buy gates. The contractor should be able to complete the post work in mid-February, so we are well on track to protecting anything we could imagine growing this year! This is exciting to me. It is very disheartening to walk into your carefully tended plantings to see deer tracks running through, seedlings and plants eaten to the ground, and row-covers ripped to tatters and rendered useless by the deer. 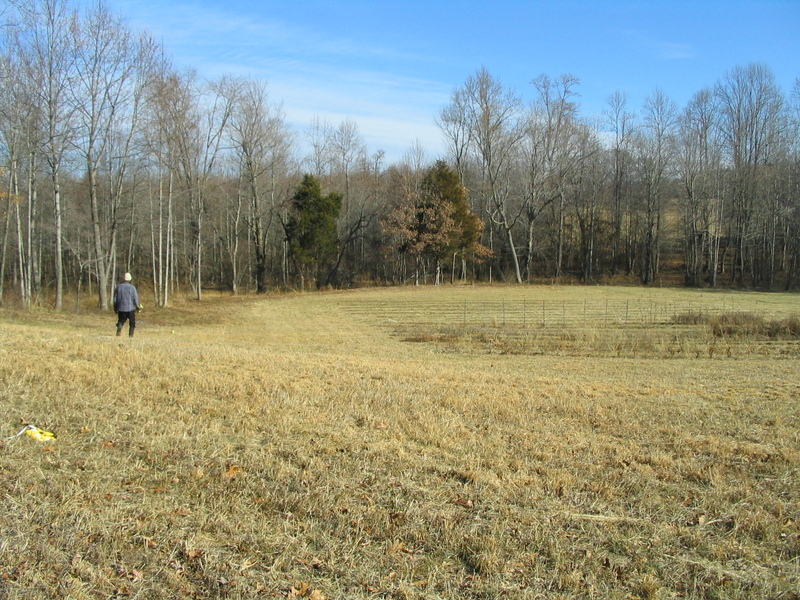 The fence will enclose about an acre and a quarter, which is more than enough space for us to get started. We figure that any future expansion will happen in structures (high tunnels/hoop houses) that we will put south of the main greenhouse, where there is plenty of open, mostly flat land. Looking south from the edge of the future shed to the south-eastern corner of the fence. The fence will go about 90 feet up the incline past the water spigots. In this area we will put our berry bushes. Looking north from the southeastern corner of the fence. Measuring to the southwest corner of the fence. We considered going up the hill further with the fence but the incline is not ideal. From the southwest corner of the future fence looking north. Gavin cleared off a good bit of brush from the western edge where the fence will go. 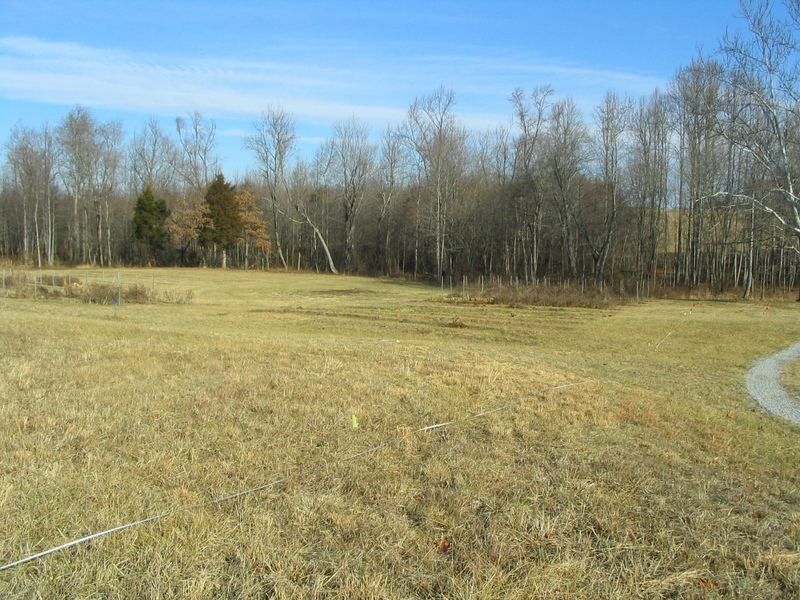 The northern side of the fence will follow the contour of the woods. There will be enough room all the way around to get the tractor around the outside to mow. 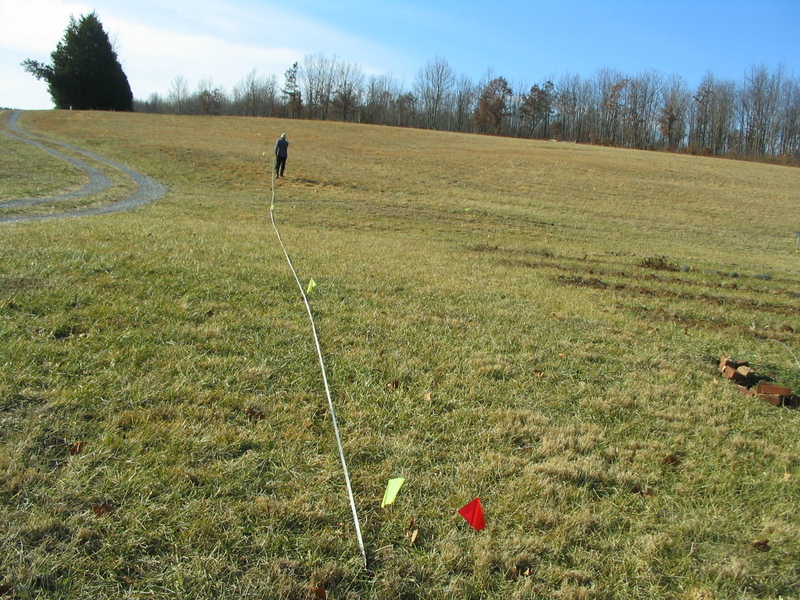 We planned the fence to use exactly the amount of wire on three rolls, which adds up to a perimeter of about 950 feet. Our next project will be to build a garden shed on the eastern edge of the fence. The shed will house the lawnmower, hand tools, and various other things which need to be easily accessed from the garden. This year we used the greenhouse for this kind of storage, but we are hoping to use the greenhouse for growing plants instead this year! Gavin has salvaged a whole pile of oak fence boards which we will re-use as the siding for the shed. 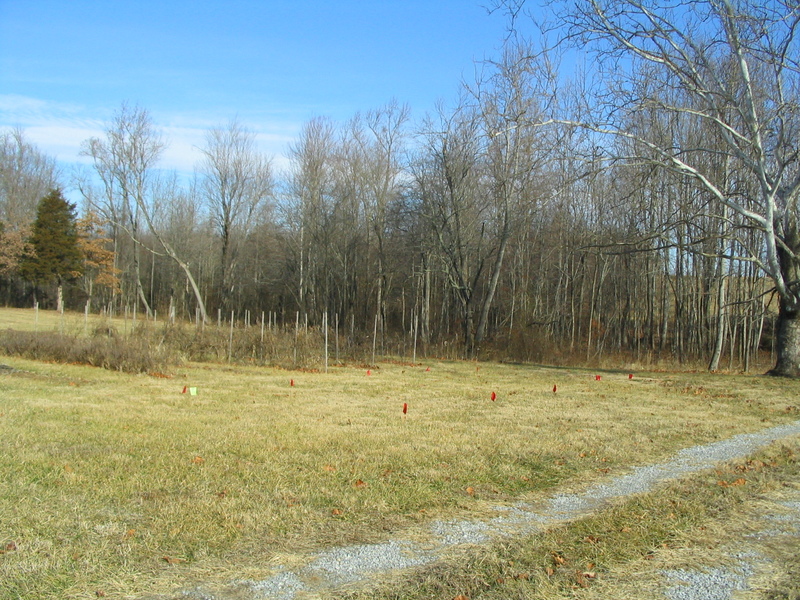 The red flags are the perimeter of the shed, which will be 32′ by 12′; yellow flags are the fence line. We also have the frame for another hoop house (high tunnel) which we’ll put up at some point this year, in the field south of the main greenhouse, as I mentioned previously. After that we will build a barn and packing area, but we will likely not focus on these projects until late this year or even next year. We have done some seed planning, and we will grow a few large crops for markets as well as many small plantings for ourselves. We plan to establish more perennial flowers and herbs in the garden this year, and prepare the ground for blueberries and raspberries, which will be planted in the spring of 2012. This year we will continue to grow and trial many different varieties of cut flowers for bouquets, and grow large crops of storage onions, potatoes, and spring peas for market. We will also grow smaller quantities of many vegetables. This winter Gavin has also been working on clearing the walking trails through the woods. 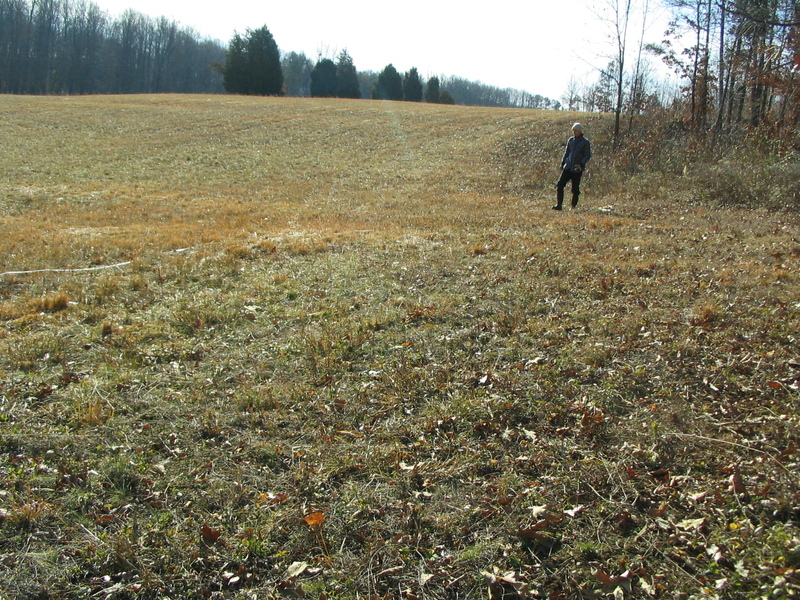 When we bought the property the previous owner had chipped several tractor-width trails through the woods, which had grown up in brush over the past few years. Now that they are clear again we can enjoy recreating in the woods! 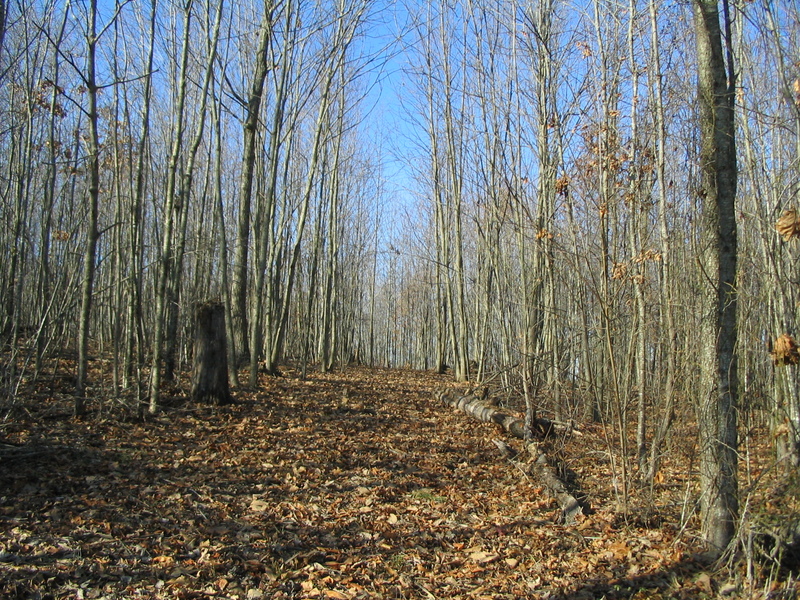 The woods aren’t terribly spectacular; they were cut over 10 to 15 years ago… but someday they will be! We are looking forward to the coming spring!